Oregano Pesto?? Vegan Pesto??? You better believe it! I did an experiment yesterday; I wanted to know whether I could make vegan oregano pesto, and whether coriander pesto would be remotely tasty. 1. A tablespoon of dried oregano (can use fresh, in which case you don’t need the boiling water). 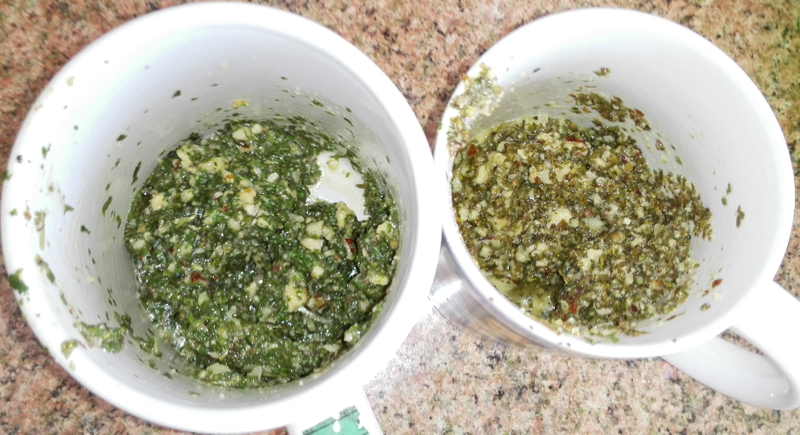 dried coriander (cilantro, left) and oregano (right). 2. A teaspoon of boiling water. 3. Half a tablespoon of olive oil. 4. 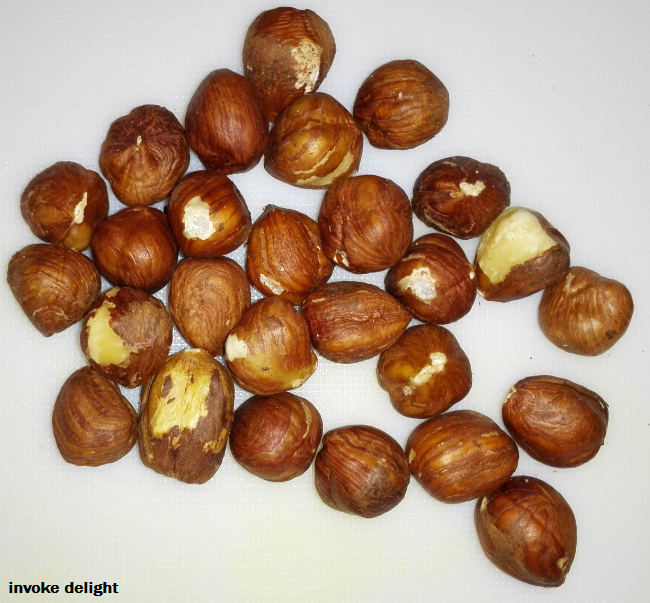 A tablespoon of hazelnuts. 5. 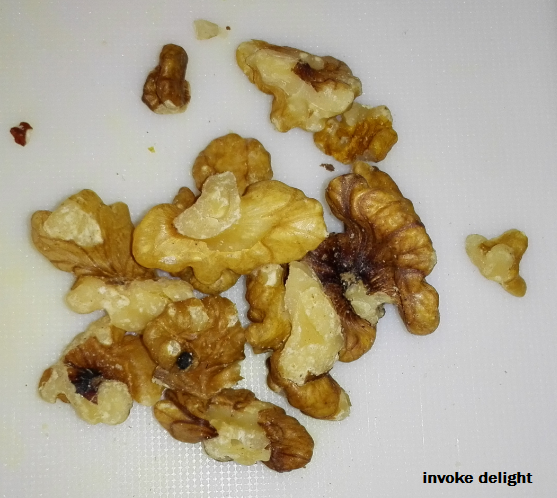 Half a tablespoon of walnuts. You will need a (hand) blender for the nuts. 1. Put the oregano in a cup. 2. 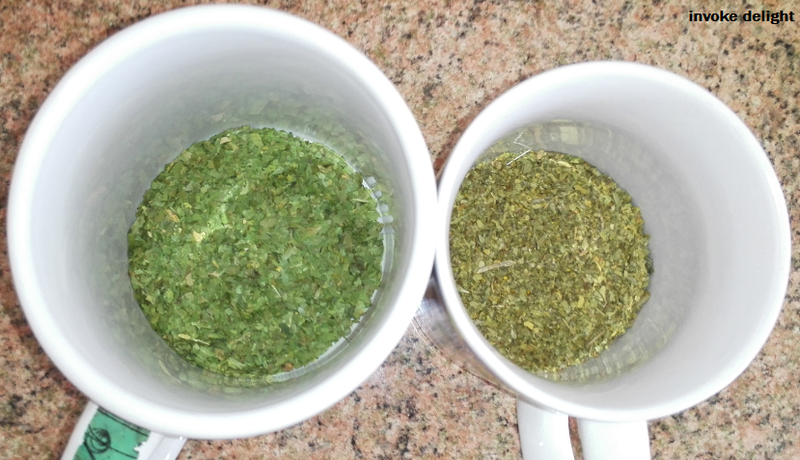 Add hot water to the oregano to rehydrate it (if using fresh oregano, skip this). 3. Crush the hazelnuts and walnuts with the blender. 4. Add the nuts to the oregano and mix in with the olive oil. Before I added the garlic and walnuts. 5. Add a sprinkle of garlic to bring out the flavour. 6. Leave to stand until the oregano has softened. 7. Mix about a tablespoon into a bowl of pasta. Mmmmm…. 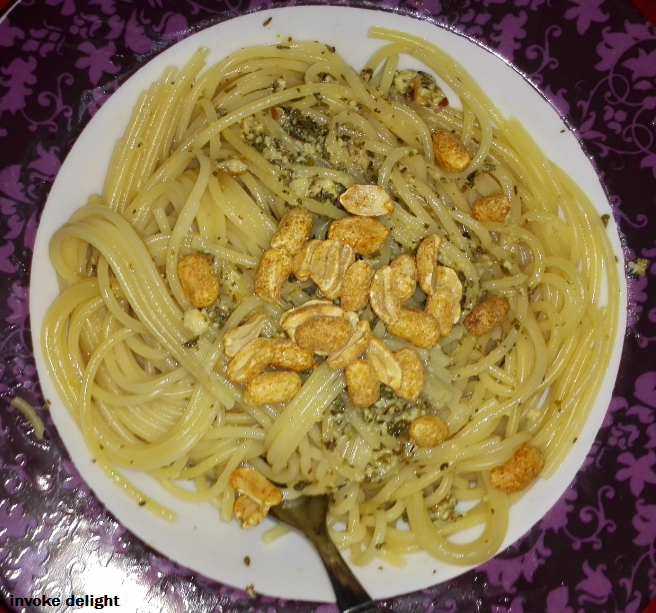 Oregano pesto over spaghetti with peanuts sprinkled on top. Very delicious. This oregano one was very, very tasty with my pasta yesterday! You could substitute basil for the oregano if you wanted a more traditional pesto and I think that would be just as tasty, maybe fresh herbs would add a less strong flavor – a little of this went a long way! I made some cilantro/coriander (they’re the same herb) pesto (same method, no garlic, use cilantro instead of oregano) and I had a little taste of that and I’m not sure it’s as nice as the oregano one, but I wondered if it was the cilantro I’d bought because it seemed to have taken on the odor from the packaging it was in. It was my first time not buying a glass jar of dried herb so it didn’t occur to me that this may happen, but the whole lot tasted a little plasticky. I will try again with fresh cilantro/coriander when I next get any because I know it has a very delicate flavor. There was supposed to be some growing in the garden but it came up as parsley even though the packet said coriander!!!! I didn’t use pine nuts (which is traditionally used in pesto) as I think they’re hideously expensive and the quality available has gone right downhill in the past few years, but hazelnuts and walnuts seemed to add a really nice taste to the oregano one. I also sprinkled my pasta with a handful of peanuts for extra protein. Do you have a good vegan pesto recipe to share? Link to it in the comments! Author MsAdventurePosted on June 1, 2015 June 1, 2015 Categories recipeTags basil, cilantro, cooking, coriander, dried herbs, food, garlic, hazelnuts, italian, lunch, olive oil, oregano, pasta, pesto, pine nuts, recipe, vegan, walnuts5 Comments on Oregano Pesto?? Vegan Pesto??? You better believe it! You can substitute the pasta for broccoli or cauliflower in this, if you need to eat more veg, or if you’re totally off processed foods. With the exception of the actual pasta itself, none of my pasta recipes contain gluten, so if you’re gluten free, replace your pasta with gluten free pasta (or broccoli) and follow the rest of the recipe as normal. (OBT): A generous sprinkling of the following herbs: garlic, basil, oregano. Cook the pasta and drain. Put it aside. Chop the onion in half, then chop it into thin strips, then cut each thin strip into 3 to make little rectangles. Using the same pan or a fresh one, heat the oil and add the onion. When the onion is sizzling along nicely, add the almonds, then once the onion starts to go transparent, add the tomato passata and the olives. I like to chop my olives in half but some people prefer to eat them whole. Stir in the herbs and simmer for about 3-5 minutes on a low heat. Put the pasta in a bowl and pour the sauce over the top.